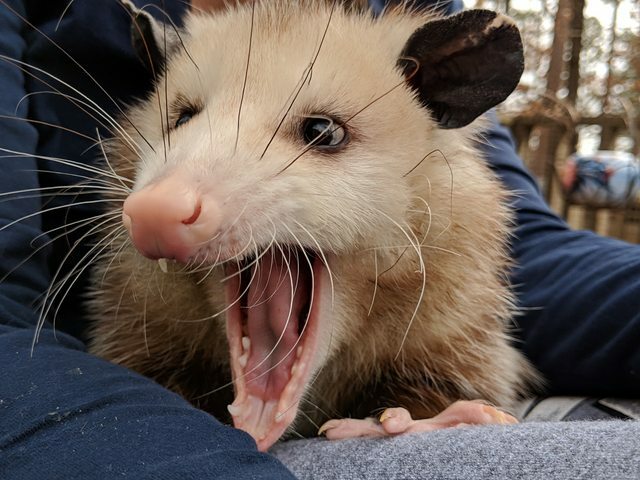 Meet “Kika my opossum,” says IMGURian overlordzelli. She's actually a rescue. We found her mom dead after falling out of a tree during a big storm. And yes dead dead. Punctured from the fall and everything. There were nine babies we took in while we tried to find a rehabilitator. Apparently they all moved away but after calling them they instructed us what to do. Eight died. Kika is all that's left. They had metabolic bone disease. We had received local farm fresh eggs and gave them their first egg. Seven died from salmonella because apparently local farm gave us bad eggs. And by bad I mean the next egg we cracked for breakfast had a fully developed dead baby chicken. I can't trust local farms after that. Zuka was caught by a coyote we think one night. She liked using the cat door. Kika has really bad arthritis so she can't be released. She has zero chance of survival. Opossums don't live all that long so I make it my motto to give her all sorts of foods to try while she has the luxury. Some of her favorites are Greek yogurt, Cheetos, and a few fancy wet cat food entrees I pick up from time to time.